How to draw vampire. 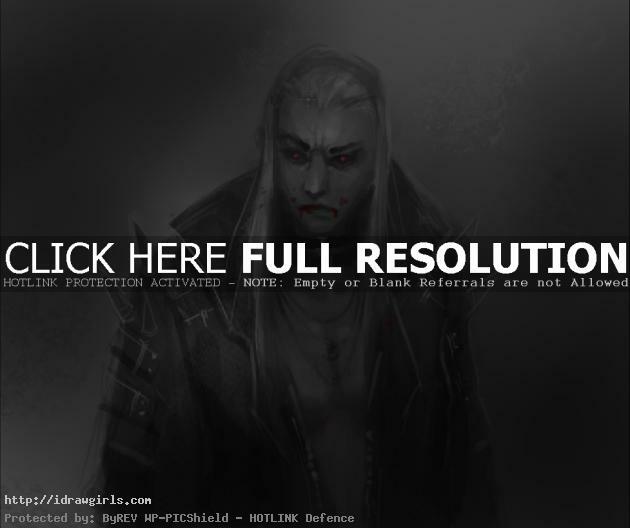 Learn how to draw a male vampire with video tutorial and step by step images. This tutorial is more or less a quick character design sketch process that I usually do on daily basis. It is quick and you can create many of them in a short time, just like thumbnails. Mainly this one will be just black and white because it is faster to draw and paint than color. Then once you have many to pick from, you can pick the one that has the most potential to make it a final character concept art. Watch the video tutorial how to draw vampire. Here are step by step images easy to follow along with the video tutorial. Step one, I draw light and loose sketch of a basic face with long hair then leather jacket with some spikes. Step 2, I paint medium gray over the whole figure to make him stand out from the background. Step 3, now I start to shade and give the figure form using value and lighting. Step 4, I paint the jacket black, his hair silver or white and add more detail to his face. And we are done. Watch the video tutorial for more in depth drawing and painting instruction. And now we have the final drawing of a male vampire.